CMPLMNTS is the first app with which you can anonymously compliment people in your environment. With the absolutely free and ad-free CMPLMNTS app, we are tackling an unconscious social problem: We don’t learn to pay compliments! The positive experience of receiving a compliment is becoming increasingly rare? And the “social lubricant” is an extremely important aspect of our coexistence. Studies show that the effect of praise inspires us. According to a study by Duke University (Durham, USA), compliments motivate even more than money. Why not make people “richer”? With CMPLMNTS you are able to compliment people in your own environment in just five seconds. We do not need any contact information and only need a picture of the user. The central element of the app is the map where you can see where there are people using the app. 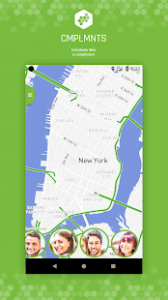 As soon as other users are in the immediate vicinity, they will appear with their picture in the bottom bar on the map. 2. if you want to compliment another user, click on the picture to select it. Afterwards a menu with the three sections “Charisma”,”Body” and “Clothing” will open. In the three categories you can select an attribute for which you want to make a compliment. 4. after receiving a compliment you can thank us anonymously. 5. for giving compliments, opening the app every day and inviting friends you will receive points to unlock received compliments. Compliments and make the world more positive! The app works almost without any contact information to the users. All we need is a picture! You will only be displayed to other users if you are in the immediate vicinity, i. e. if you can see yourself with your own eyes. User clouds are only displayed if there are at least two app users within a defined radius. Individual persons cannot be located at any time.